A pair of very elegant and extraordinary shaped Art Deco (re-produced) armchairs, in the style of Jules Leleu. Fine Macassar veneer in combination with sandy colored alcantara leather fabric from Èlitis / France. Art Deco oak armchair, circa 1940, in the style of Jules Leleu. 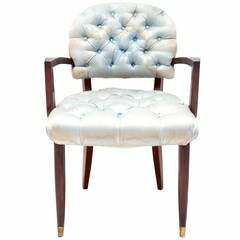 Art Deco Armchair by Jules Leleu in mahogany with gilt bronze sabots with the original silk buttoned upholstery. 1930s armchair by Art Deco master Jules Leleu. Numbered on right back leg 15560. Pair of Art Deco armchairs, in the style of Jules Leleu, circa 1940-1950. 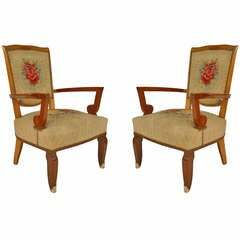 A pair of fine French Art Deco cherrywood armchairs by Jules Leleu. 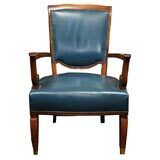 A set of four French Art Deco armchairs by Leleu, in rosewood upholstered with blue/vert leather. Model 2915, circa 1939.